A small Society of 8 members was formed in 1813. In 1822 a piece of ground was acquired from Mr W. Lund of Flaxton and on this site the present Chapel was erected at a cost of £200. The present members are committed to maintaining a Christian presence within the community. Details of services can be found on the Chapel notice board, and in The Circular, and periodic United Service leaflets. 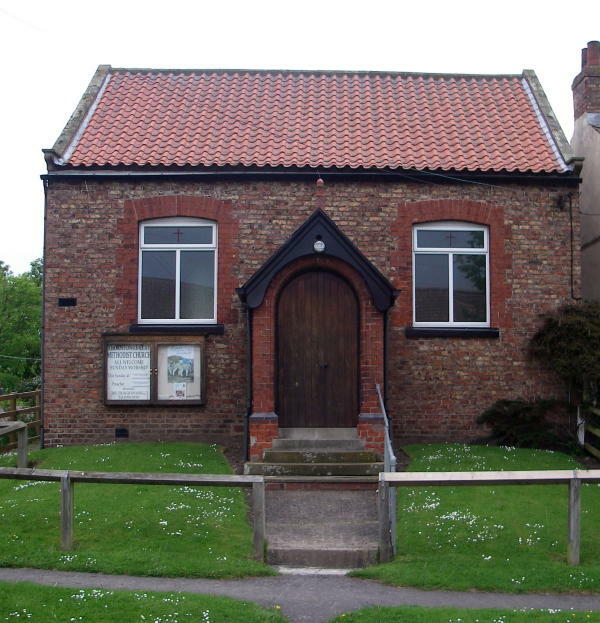 The Methodist Church Thornton-Le-Clay meets for worship at 9.00am. on the first and third Sunday and at 10.30am. on the second, fourth and fifth Sunday in every month. All ages are welcome to attend any services, see the Church notice board for details. A bible study / Fellowship group meets fortnightly at Wold Cottage, High Street, Thornton-Le-Clay from 8.00pm. A time of informal Bible discussion, readings and prayer followed by light refreshments. For more details ring 01904 794626 or 01653 618452. A mothering Sunday Family Service will be held at Thornton-Le-Clay Methodist Church on Sunday 10th March 2013 at 10.30am. led by Lis Johnstone. All welcome. On Friday March 29th a short service at 6.15pm. Led by Rev. Graham Peaden. Easter Day Sunday March 31st Holy Communion Service at 9.00am. Led by Rev. Graham Peaden. All welcome. Don’t forget if you would like any prayers said for you or someone you know to leave a note in the Prayer Box situated on the side of the Thornton-Le-Clay Parish Notice Board. On Sunday April 21st 2013 there will be another “Messy Church” in the Village Hall starting at 4.00pm, do come and join us. We do a verity of activities including crafts, stories, games, worship and ending with food! All ages welcome (children must be accompanied by an adult). The Prize Draw on December 14th raised £750.00 for Thornton–Le–Clay Methodist Church. A big thank you to all who helped in any way, the ticket sellers and all who provided prizes. Sitting in my study one evening a few weeks ago I heard a great honking noise that grew louder and louder. Curiosity finally got the better of me and going to the window I looked up and saw several hundred geese flying in five formations. As I stood and watched this incredible sight I became aware that the lead bird was changing direction. Lower and lower, nearer and nearer they got until finally all were safely on the ground in the field just beyond the back fence. The noise was incredible! Why had they landed in the field I wondered? Then I remembered the grain I put out each week at this time of year. Usually it attracts pigeons, pheasants and all sorts of small birds but never geese. As I watched I remembered a story about a farmer who didn’t believe in Christmas. The idea that God would become a man was absurd and often chided his wife for her faith and belief. One snowy evening he was at home relaxing. His wife had taken the children to the village carol service at the chapel. And once again he had mocked her for her beliefs before she left. Outside he could hear the howling of the wind in the tress and was glad he wasn’t so foolish as to go out on such wild night. And with a great sigh of contentment he sunk into his armchair before the blazing fire and fell asleep. It wasn’t long before he was awakened by a loud thump against the window. Then another, and another, and another! Wrapping himself up he ventured outside to see what all the noise was about. There in the field was a flock of geese! They had been migrating south but had become disorientated by the storm, stranded on his farm unable to fly or see their way. The farmer, filled with compassion, tried to help and realised the barn would be a better place to shelter. Struggling against the wind and snow he opened the big barn doors hoping they would go in. They didn’t realise it would give them shelter so he tried to shoo the geese in but they ran in all directions. Perplexed he got some bread and laid a trail to the barn doors but still they didn’t catch on. Frustrated, he shouted, ‘Why don’t they follow me? Can’t they see this is the only place they can survive the storm?’ He thought for a moment and then realised they wouldn’t follow a human being. Now if I could become one of them they would follow me and I could save them. Then, for the first time he understood the meaning of the Christmas story and why God so loved him, his wife, his children in fact the whole world by sending his son Jesus Christ. Falling to his knees he worshipped him. Don’t forget to feed the birds – you never know what might surprise you….